DAN Studley has been forced to withdraw from the England team competing at the inaugural Commonwealth Half-Marathon Championships in Cardiff on Sunday. The Bristol & West AC runner (pictured left) made the decision after missing two weeks of training due to an injury in his foot and decided not to risk further aggravating the problem. “I am probably back to 70-80 training now and hope to be up to 100 per cent in the next week or so,” said Studley. “Unfortunately, the injury came at the wrong time for me. It was inflammation in a joint on one of my toes and while only a small injury every step I took felt pretty painful. Studley was clearly disappointed to miss this new event which has attracted teams from Australia, Botswana, Ghana, Kenya, Mauritius, New Zealand, Rwanda, Sierra Leone, Tanzania, South Africa, Uganda, England, Scotland, Northern Ireland and Wales. “I probably tried to chase too many short term goals this year and have been racing hard for the past ten months,” added Studley. “But if at the start of the year you would have told me that I would run PBs at every distance and win by first GB vest at the World Half Marathon Championships I would have bitten off your hand. Studley made his debut for Great Britain at the World Half Marathon Championships in Valencia last March. Since then he has also recorded PBs on the track over 5000m, clocking 13mins 53.55secs at the Morton Games in Dublin to break 14 minutes for the first time and in the 10,000m running 29:15.14 at the Highgate meeting. 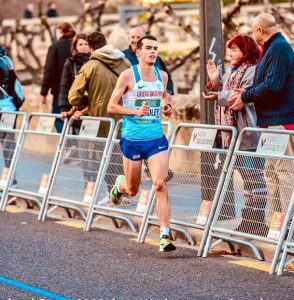 He also ran a PB of 64mins 23secs for the half marathon in Barcelona at the start of the year to get the ball rolling in what has been a terrific 2018.